Tournament favourites France will face the underdog Iceland in the concluding quarter-final on Sunday evening. Les Blues are out-and-out favourites, but will know not to underestimate Iceland who defied their low ranking and lower odds to beat England in the round of 16. The fairytale continues for the smallest ever Euro 2016 quarter-finalist, but with France starting to turn up, how much longer will the dream stay alive? It took three and a half games, but the French team that we all love and know have finally come to life at the European Championship. Stunned and trailing Ireland thanks to a second-minute Robbie Brady penalty, they were jeered off the field at half-time. Nonetheless, the host nation returned for the second half a different team - a much improved team - and they made the Irish pay for their insolence. The deficit was soon overturned, and when Shane Duffy was dismissed in the second half, there was no way back. France were devastating while Ireland’s defence disintegrated during which Antoine Griezmann scored twice to give his team an all important place in the quarter-finals. Les Bleus faced a test of nerve, ability and managerial vision under extreme pressure, yet endured all the same. N'Golo Kante will miss the quarter-final after he picked up a suspension following his yellow card against Ireland – his second of the tournament. Yohan Cabaye is the most suitable and likely midfielder to replace him. The Crystal Palace midfielder is gifted with vision and creativity, but also doesn’t shy away from tackles as he looks to break up play, before unleashing his teammates with swift counter-attacking through-balls. Cabaye will be paired in the centre of the park with Paul Pogba and Blaise Matuidi, who have both stepped up their game of late, playing in box-to-box roles, defending and attacking the game with urgency. Griezmann, Dimitri Payet and Olivier Giroud complete the front three of France’s 4-3-3 formation. 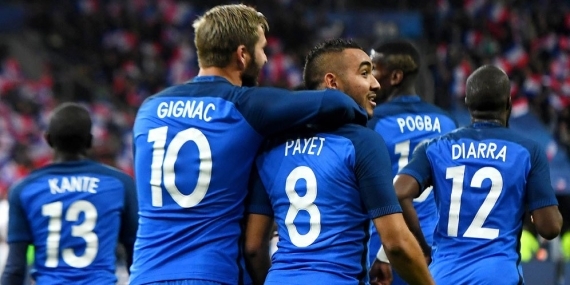 Payet has been superb with his quick feet, vision and eye for goal, while Griezmann’s pace, trickery and prowess in the 18-yard area has proved vital. Giroud may be a bit quite thus far, but his hold up play allows his teammates to run off him, which creates plenty of opportunities for a chance at goal. France are now up and running, but the question is, can they do it again? They will be up against another underdog, and definitely not a team to be taken lightly after embarrassing England. Nevertheless, France are favourites for a reason, and with the support of a nation behind them, they should be difficult to defeat. Having already surprised many by getting out of the group stage, Iceland’s Cinderella story continues after stunning England 2-1 on Monday night. While the win wasn’t by an astonishing margin, when you consider the differences between the two countries, even the smallest of wins seems insurmountable. Take, for example, the fact that Iceland has a population of an estimated 330,000. England has more than 53 million. Iceland may lack in world class players, but they have a team that possess an outstanding work ethic and fighting spirit, which has certainly worked for them. They have effectively used a defensive strategy that has stymied opponents, holding them to just one goal per game during the group stage despite getting badly outshot and out possessed. Expect more of the same from Iceland, who will look to capitalize on rare goalscoring opportunities while holding off a likely offensive onslaught from the French. Iceland’s very presence at the Championships came against all the odds. A volcanic island blanketed by year-round glaciers, the nation has the world’s shortest soccer season. In France, Iceland’s Viking Warriors have received a warm welcome — not just because soccer fans love an underdog, but because they possess something exceedingly rare in today’s Europe: passionate patriotism that has not spilled over into extremism. In the nation of Iceland, 10% of the population regularly play football, and the national team was picked from a pool of 100 full-time professionals playing across Europe. Now, they will look to keep the party going with another chance to knock off a world powerhouse on Sunday. As much as I love a good underdog, France should prove too strong for Iceland. It’s been a pleasant surprise to see them reach the quarter-finals, but as they say ‘all good things must come to an end’. Back France to book their place in the semi-finals in 90 minutes.